Padfolios can add great daily value by providing you a place to store all your essential stationery items. When you add a clipboard to a padfolio, it turns into a great product that writing stability and storing capacity. The Samsill Clipboard Portfolio is a high-quality product that makes the task of a student or office going professional easy by offering great comfort and value. It has a classic design perfect for any environment and is made of long lasting materials. It is an ideal product for those who are always on the lookout for the best value in the products they buy. The Samsill Value Padfolio with Clipboard is constructed with sealed heavyweight leather grain vinyl, which is not only great looking but durable. It includes a letter size writing pad (8.5" x 11") for a comfortable writing experience. 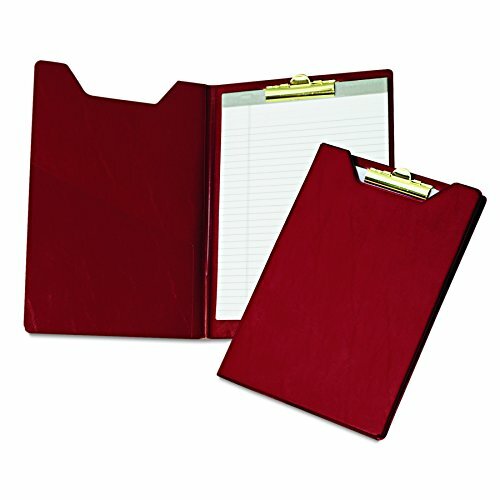 The clipboard allows a user to write conveniently with the documents perfectly attached to the Samsill Value Padfolio. An inside document pocket for additional storage can be used for keeping the loose documents, business cards and miscellaneous items. It showcases the perfect padfolio and clipboard combination as it features a strong brass clip and die-cut cover. The look and feel of the product combined with its attractive price make it a worthwhile product for office going crowd and college students. With its resilient construction, it will surely serve you for a long time. For all men and women out there, from students & graduates to top executives, who are looking for a padfolio with additional clipboard functionality. If you wish to try out the most versatile value padfolio there is, click ‘Add to Cart’ & order Samsill Clipboard Padfolio today!